Traffic on Veirs Mill rd. Veirs Mill Rd. 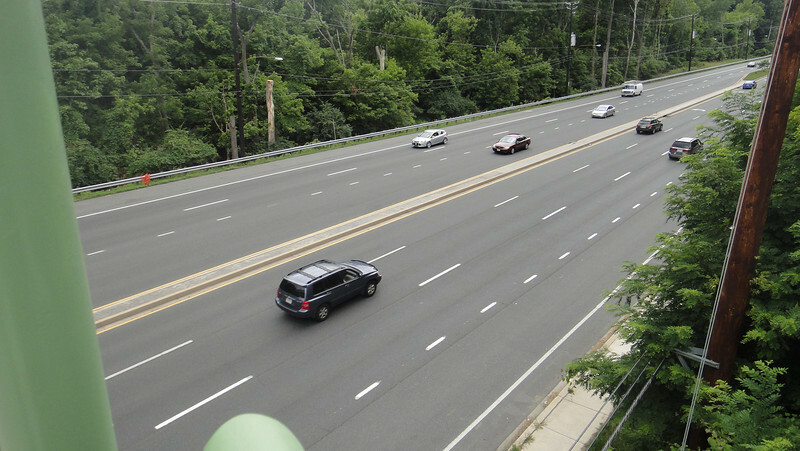 is a high volume road running from Wheaton, MD to Rockville, MD. As a result of this traffic, crossing Veirs Mill Road at Aspen Hill Road was slow and dangerous for pedestrians and bikers on Maryland's Rock Creek Hiker-Biker Trail. The intersection at Aspen Hill Road featured an unsignalized crosswalk. In addition this section of trail was incomplete requiring navigation through local streets to continue on the trail. The Rock Creek Trail connects Rockville with Washington, D.C via 22 miles of trails. To address the safety and congestion concerns in 2004 $3.95 million in TE funds were applied to a project to build a bicycle and pedestrian bridge over Veirs Mill. $5.15 million in local funds were also applied to the project. The construction of the bridge included trail connections to transit and communities, signage, lighting, stormwater management, aesthetics, and stairs. Construction of the project began in 2008 and finished in early 2011. The project not only facilitates crossing Veirs Mill Road for bicyclists and pedestrians but also helps to reduce congestion for drivers. In 2003 Veirs Mill road had already been identified as having a failing level of service in the A.M. peak and P.M. peak times with congestion only supposed to increase. The existing at-grade crossings were dangerous and inconvenient to pedestrians and motorists alike. The new bridge has created a safe, attractive, and easy way for bicycles, pedestrians, and motorists to travel along or across Veirs Mill road.